Given the wild success of various Android tablets that are smaller than the iPad many analysts began to consider the fact that Apple may release a 7 inch iPad. There have been dozens of rumors and even plenty of manufacturing details but currently analysts say that it is unlikely that we will see an iPad in the 7 inch area in 2012. Various sources that are generally quite accurate have made it clear that Apple is not planning to release a mini iPad anytime soon. The reasons are abundant, though the primary reason is simply that Steve Jobs was very opposed to a smaller iPad so no development could have begun. 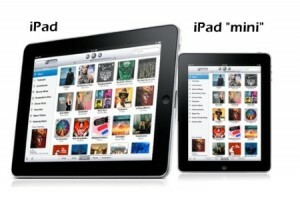 No word yet on when the iPad 3 will come out but don’t count on a baby brother coming out with it.